There are times when you want to write your experiences, and then there are times when you want to have a writing experience. For the latter, only the finest pen, ink and paper will do. 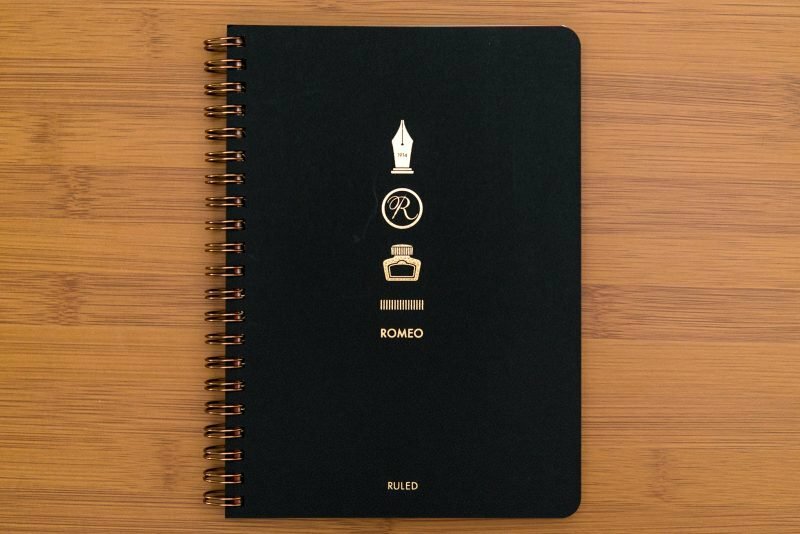 For your paper choice, I would highly recommend you consider an Itoya Romeo notebook. While they are not easy to find and certainly aren’t cheap, they have some of my favorite paper that is truly different from any other paper I’ve used. I first came across the Romeo notebook in a shop in San Francisco called Topdrawer, which is an American Itoya brand store. 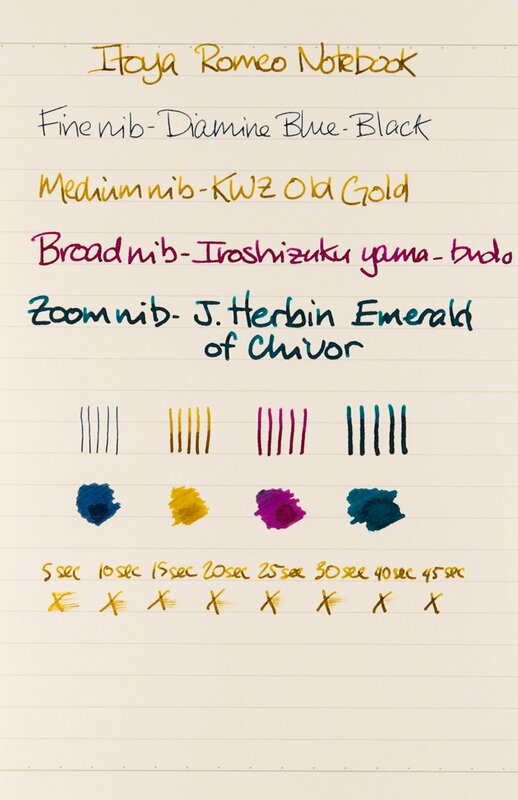 They had a sample along with a few fountain pens to test it with. I’m always looking for a good fountain pen friendly notebook, so I gave it a try. I couldn’t believe how smooth the paper felt! I definitely wasn’t expecting to come across such nice paper. Once I got over my initial shock at how nice the paper was, I took a look at the notebook itself. The paper is noticeably thicker than most notebook paper. The cover design and material is quite classy and attractive. Once you open up the cover, you’ll be greeted with an interesting first page. While it is definitely interesting to look at, I think it can also serve as blotting paper, but unless you tear it out it will only work for the first page of the notebook. 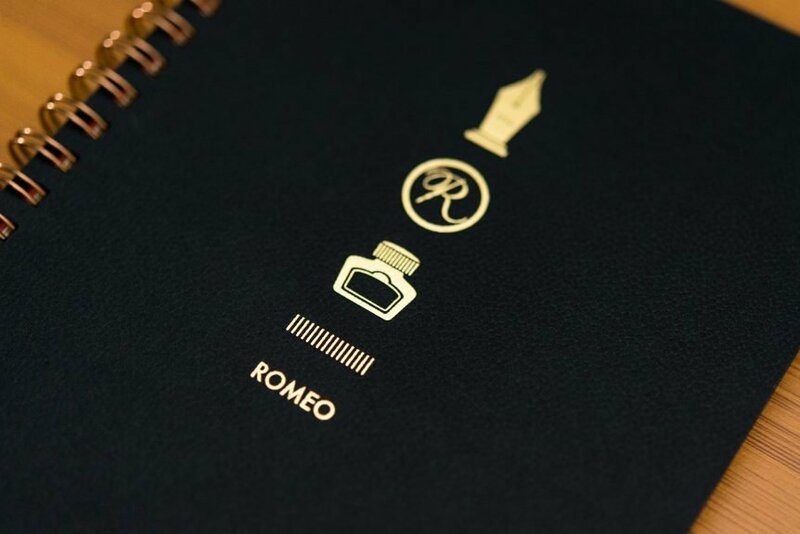 The cover of the Romeo notebook is classy and attractive. 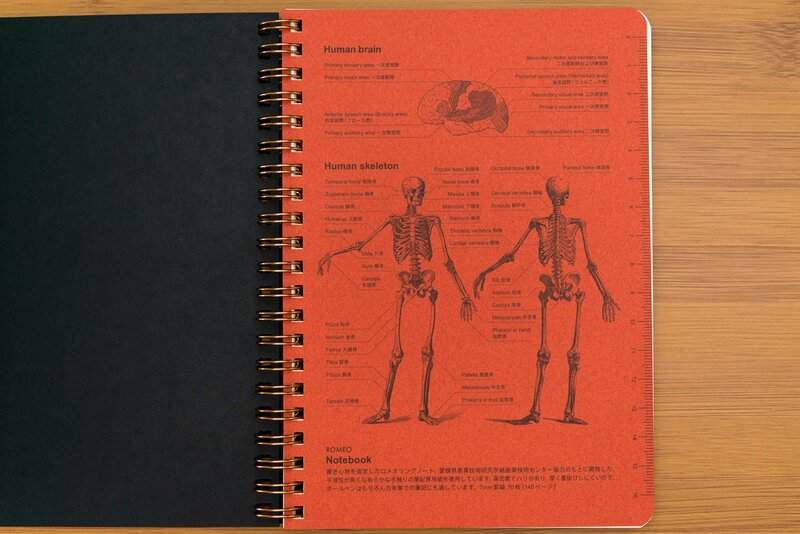 The first page of each notebook has something interesting like this image of a skeleton. Let’s take a closer look at this notebook and see what it’s all about. 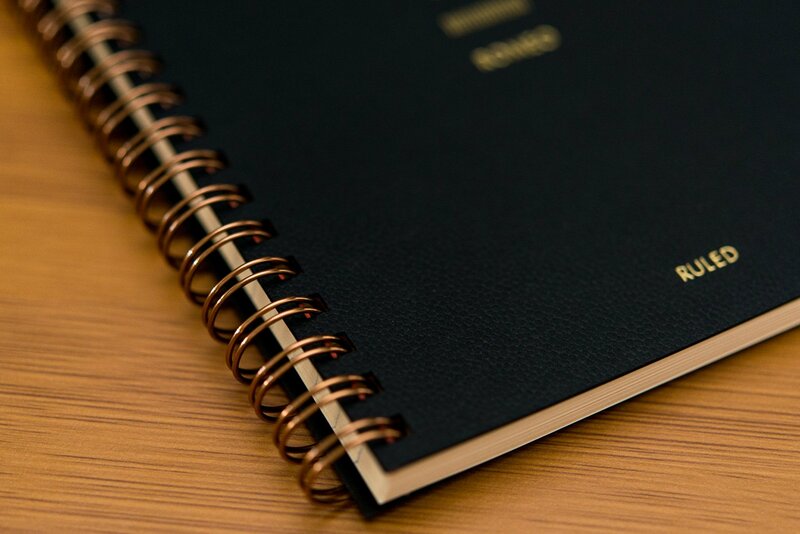 The double spiral binding helps keep the pages secure and laying flat. 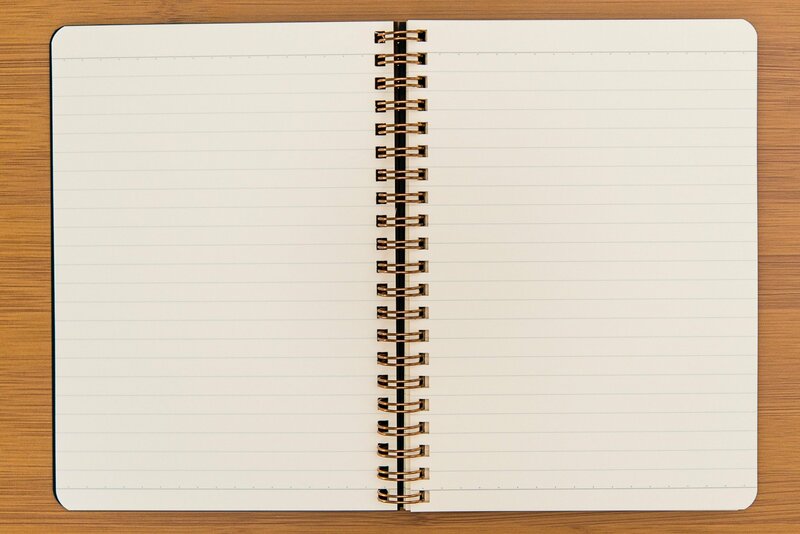 Let’s start with a discussion about the notebook itself before we get to the paper. As I mentioned, I really like the overall design and feel of the notebook. The graphics on the cover are gold foil and add a nice accent without being distracting. The cover material looks and feels nice. It is stiff enough that you can use the notebook without a hard surface underneath it. Finally, the spiral binding is very nice and allows the notebook to open up very smoothly and lay flat. Other than that, there aren’t really any other features to this notebook. Now let’s talk about the paper. To say that I love writing on this paper is an understatement. It is silky smooth, but not slick like some papers (I’m thinking of Clairefontaine Triomphe). Writing on it feels incredibly luxurious. It has a light cream color and the lines are a light grey. It has small margins at the top and bottom that are noted by a slightly darker grey line. 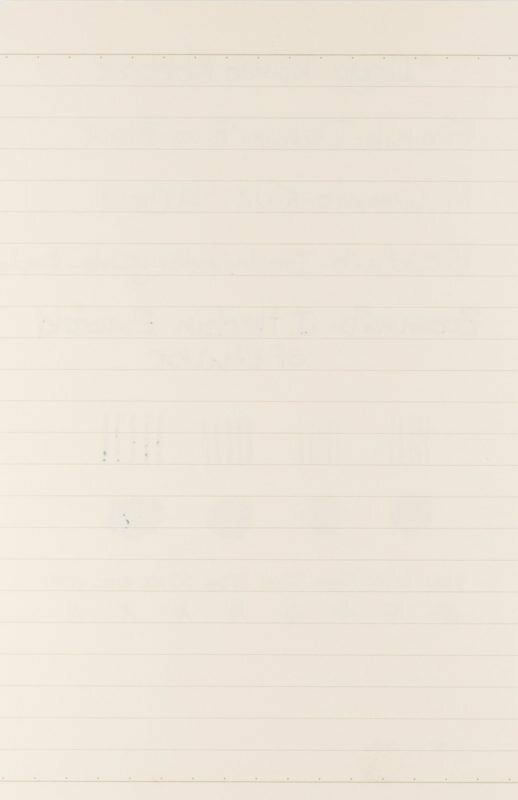 The lined paper has a simple, clean layout. This paper handles fountain pen ink very well. About the only drawback it has is that ink can take quite a while to dry, but it does have shorter dry times than Tomoe River. Fortunately, those longer dry times lead to great sheen. This paper also has great shading that is better than what I’ve experienced with Tomoe River. 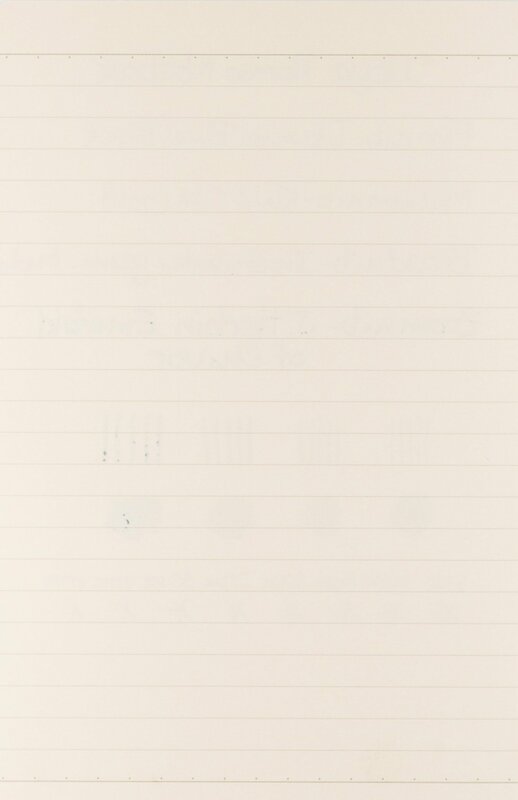 Writing Test – Front: The Romeo paper shows great shading and sheen with no feathering. The weight of the paper makes it very resistant to ghosting. Writing on both sides of a page should not be a problem. Since the paper is fairly expensive, this is definitely a good thing. I did experience a bit of bleeding with heavy applications of super-saturated inks, but almost all of my pens and inks behaved well. I didn’t observe any feathering in any writing samples. In general, you should expect very good performance from this paper unless you use very wet pens with highly saturated inks. Even so, the bleeding isn’t enough to deter me from using this paper with any combination of pen and ink that I want. Writing Test – Back: You can see there was very little ghosting and just a bit of bleeding. I’ve tried out a lot of different fountain pen friendly papers and notebooks and it takes quite a bit to surprise me, not to mention impress me. When I first tried out the Romeo notebook in the store, I was shocked at how smooth it felt to write on. Once I got home and wrote in it some more, I was amazed at how much I enjoyed writing in it every time I sat down and used it. If you like a lot of extra features in a notebook, the Itoya Romeo probably isn’t the best choice for you. It has no page marker, elastic closure, page numbers, back pocket or index. What it does have is a simple, clean design and amazing paper. The paper is unlike any other paper I’ve used. It is smooth without being slick. Its heavy weight and creamy color make it look and feel extremely luxurious. In my Tomoe Paper review, I compared it to a sports car. I would compare the paper in the Romeo notebook to a high-end luxury car. No matter which pen you’re using, it glides across the surface and feels wonderful. Writing becomes an elevated experience, even more so than just using a fountain pen. For me, writing in a Romeo notebook is something that I look forward to and savor. Interested in trying out a Romeo notebook? You should be. They are simply amazing. Unfortunately, they are quite difficult to find. If you’re lucky enough to live in San Francisco, head over to Topdrawer. They don’t always have them in stock and when they get them they sell out fast, so you might want to call ahead. Other cities that have a shop that sells items from Itoya might have them as well. I found them for sale on the the Itoya web site, but have never tried ordering from it. Also, it should be noted that this is not the same notebook as the Itoya Oasis, which can be found on Amazon and is not made with the same paper. No matter where you find it, I hope you get a chance to try one out someday. Happy hunting!